It’s very easy to throw all your healthy lifestyle habits out of the window in December only to spend January gloomily depriving yourself to make up for all the over-indulgence. Take a little extra care of yourself this Christmas and you’ll start 2018 feeling much better.Then you won’t need to set a host punishing resolutions. Here are some of my tips to help you through the festive season without ending up a total wreck come January 1st. Snack wisely. Have a good supply of unsalted nuts, seeds and olives to serve as healthy snacks when friends pop round for drinks. These foods keep your blood sugar balanced and help you avoid bingeing on unhealthy foods after you’ve had a few drinks. Put something fishy on the menu. Smoked salmon is a wonderfully healthy festive treat packed with omega 3 fats to keep your skin and hair shining. Use as a starter or in canapes. For a change try smoked trout or mackerel. Click here for a delicious Smoked Mackerel Pate recipe. It’s okay to be cheesy. Cheese sometimes suffers with a bad reputation as a high fat unhealthy food. 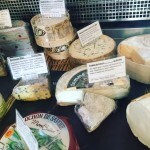 But research shows that some cheese particularly those made with unpasteurised milk are full of beneficial bacteria which are so important for our gut health. A healthy gut is linked with improved mental, immune, cardiovascular and many other areas of our well-being. So a little cheese this Christmas, particularly some lovely gooey “stinky” varieties or blue cheese like Stilton or Roquefort combined with some celery sticks or a few red grapes can be very good for you! Try out my Festive salad which uses walnuts, clementines & blue cheese. Get in the mood for turkey. Tuck into your turkey, an excellent low fat source of protein, it also helps your brain produce serotonin- the happy neurotransmitter. Slip all your grumpy relatives an extra slice! Don’t be a couch potato. Get up and move around between courses to prevent bloating. Encourage all the family to go for a daily walk to burn up a few calories and spend quality time together. Eat slowly and chew well. This helps you digest your food properly and gives your brain the chance to recognise that you are full before you become uncomfortably stuffed. Enjoy a vit C fizz. Buy in some cava or prosecco and serve with freshly squeezed orange or clementine juice to get a vitamin C boost. Raspberry or blackberry puree also work well. Keep some in an ice tray in the freezer. Don’t forget the virgin mary. Tomato juice served with a celery stick, a slice of lemon or lime and a dash or tabasco is perfect for those mornings when you’re not feeling so bright or evenings when you simply want a break from alcohol. Tomatoes are rich in lycopene a powerful antioxidant . “Big Tom” is a delicious ready mixed tomato juice available in many supermarkets. Spice up your porridge. For a festive start to the day- sprinkle your porridge with ground cinnamon, grated apple and a few walnuts. Stock up on peppermint or fennel tea. Drink these instead of coffee after your meals to help relieve bloating and indigestion. Too much caffeine can make you more anxious or irritable which might not be a good thing if you’re thrown together with relatives for an extended period of time! And finally, be kind to yourself. There’s so much pressure to make Christmas special for everybody else but be sure to carve out some time to do the things that you enjoy.